Dragon Eyes, check it out. 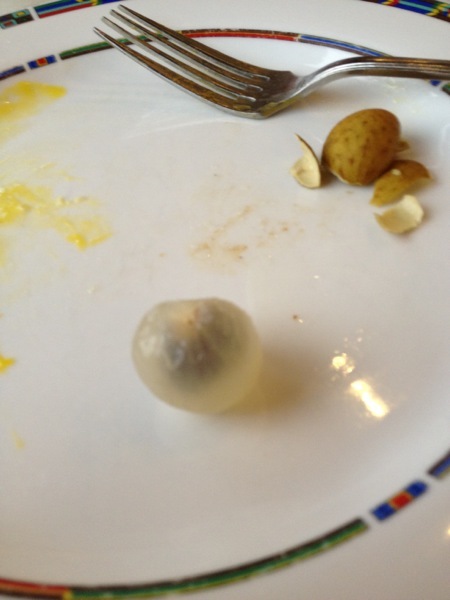 In the picture below you can see the fruit with the peel off. It looks like an eyeball. The peel just below my fork kind of looks like what a dragon's skin might look like, maybe? This is after I bit off half of the meaty part of the fruit. You can see the seed (or pit, I don't konw the difference) and this thing totally looks like an eye. It tastes sweet, but not super sweet. This is what remains after you've eaten all the edible stuff. It looks like a pupil. There you have it, the Dragon's Eye. If you have the chance, eat one, they're quite delicious. Great deal on a great book!